After exploring around the National Portrait Gallery in the afternoon, I slowly developed a craving for something sweet as an afternoon pick-me-up. I knew I wanted something sweet, but light, because it was a rather hot DC summer day. 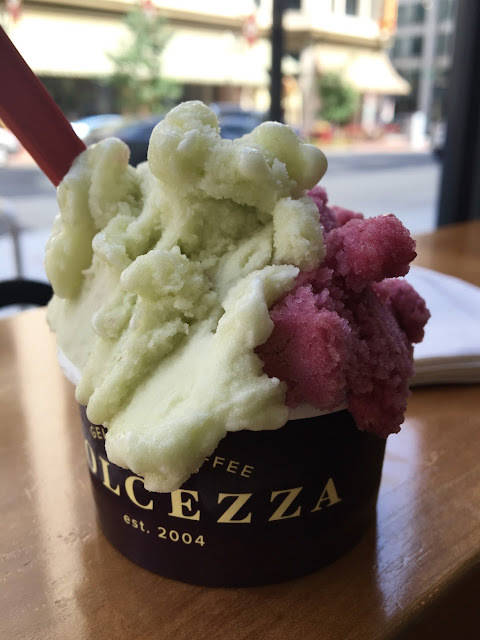 Sorbet immediately came to mind, and a quick online search revealed that Dolcezza was nearby. Offering coffee, sorbet, and gelato, this old world style shop offers small batch, locally sourced treats. 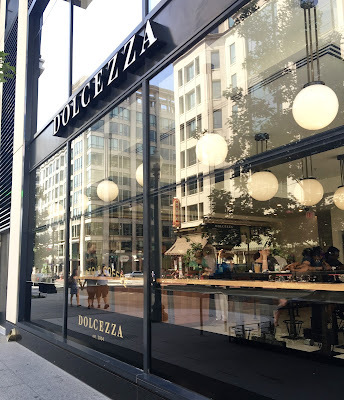 I have seen Doclezza gelato and sorbet at local markets in Baltimore, never realizing that they are locally made right in the District, and that flavors are sourced seasonally to ensure peak flavor. While I was bummed I could not have the chance to visit the factory (near Union Market), the metro center location definitely served my craving, and surprised me with unconventional sorbet. After my visit, I will never view boring, one-note sorbet in the same light ever again after visiting this foodie haven. Each day, the line up of sorbets and gelatos change, because I'm dairy-free, this review focuses only on the sorbet, which is water-based and made separately from gelato to reduce cross contamination. None of the sorbet flavors contain gluten, so cross contamination is also prevented there. After assured the sorbet was safe, I took in the list of innovative list of daily flavors, all of which sounded amazing. A small bowl, which includes two flavors, will run you a little over $5, a large, which includes three, runs above $6. Pre-filled push pops (I couldn't snap a good picture) run $3. Expensive, yes, but as I found- worth the indulgence. You are given unlimited taste tests- to find a flavor that speaks to you. I was sold after my first two trials- lime cilantro and blueberry lemonade. The lime- bursting with tart limey flavor had a nice kick from the cilantro. It was totally refreshing and definitely woke up my tastebuds and brain. The blueberry lemonade, also packing some sourness was mostly sweet, with the freshness of the berries taking center stage. The pairing of the sorbets was nice because it allowed me to interchange flavors, which made for a delicious experience. The texture on both was smooth and creamy, decadent without being heavy. Dolcezza clearly does sorbet right by using seasonal flavors and keeping it local with their factory also located in DC. The flavors I tried were top notch, and the staff were helpful. 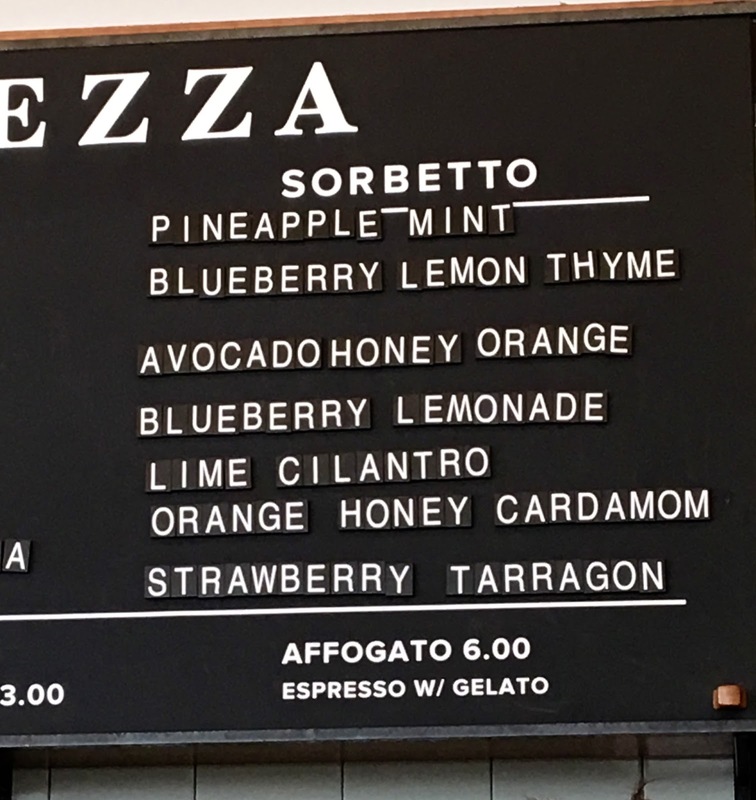 The feeling of the store is definitely hipster, but don't let the high prices and sophisticated flavors turn you away- it all boils down to real, good sorbet and gelato. I'd happily pay for the occasional treat, and am already looking forward to a future visit.